Lake science is quite fascinating because of the number of variables that can influence conditions. “Limnology,” as it is called, is also a very new science so new discoveries and theories are common. This science is even interesting to the non-scientist. Winter is a slow time for lakes because the ice cover cuts off the sunlight and wind and most of the inhabitants are enjoying a sluggish lifestyle in a stagnant environment. If it were not for the fact that ice is lighter than water, lakes would freeze from the bottom up and most of the lake creatures would be in serious trouble. 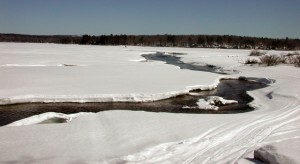 Spring brings ice melt, warming of the surface waters, winds, and a complete mixing – a kind of rebirth. As summer arrives, lakes deeper than 30 feet or so will gradually separate or stratify into a warm top layer and a cold bottom layer. Much of the important data is developed during the late summer when we see how lakes act under their worst conditions. Lakes that are layered show their problems prominently in the isolated bottom waters below the thermal barrier (thermocline) that prevents them from mixing with the warmer surface waters. The upper, warm waters are constantly wind mixed which “folds in” oxygen. If the thermal barrier did not exist, we would have no cold waters to support trout and salmon, but the isolation of these cold waters keeps them from replenishing their oxygen by wind mixing. Oxygen and temperature are measured in the field using an electronic meter with attached sensing probes. The critical element for understanding lake health is phosphorus – lake algae populations are typically limited by phosphorus concentrations in the water. Add phosphorus and more algae grow. Since algae are plants, they can only grow in the upper, sunlit waters. As their populations increase, water clarity diminishes. Some look like miniature fuzzy basketballs and some like tapioca particles – there are dozens of species native to our waters, each with its own unusual shape, color and arrangement. They are short-lived and die after a few weeks, left to drift by gravity to the bottom waters where they decompose. “Counting” a lake's algae population is accomplished by measuring the green plant pigment, chlorophyll. A hose is lowered into the lake and is capped to capture a column of water. This sample is drawn through a filter that the lab analyzes for chlorophyll content. 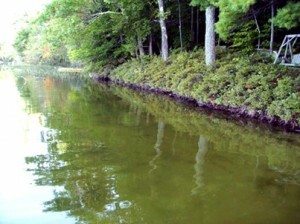 Dead algae are decomposed by bacteria in the bottom waters of the lake. This process consumes oxygen. More phosphorus means more algae. More algae mean more decomposition. More decomposition means less oxygen. This is the link between what goes on in the watershed and what happens in the lake. Phosphorus comes from the land and determines the water quality. Uses of land that cause erosion and sedimentation are the worst culprits since phosphorus is a natural element in soils. Clay particles are richest in phosphorus because of a chemical attraction and because they have a lot of surface area as compared to their size and weight. Through a microscope they look like paper plates, while sand and gravel are more like small globes. Another problem for lakes is that these clay particles are carried too easily by stormwater runoff. The heavier and less phosphorus rich soil particles like sand and gravel tend to settle out more quickly. Excessive decomposition of organic matter can use up all of the available oxygen in the bottom waters of a lake. This can cause a complex chemical reaction, which releases sediment bound phosphorus into the water column. This process is called internal phosphorus recycling and it can add large amounts of phosphorus to the lake. This stimulates more algal growth, leads to less dissolved oxygen in the bottom waters and further offsets the lake's natural equilibrium. Following summer stratification, cool fall winds chill the warm upper waters until the temperature differential is weak. Then the stratification breaks down and the “fall turnover” occurs. This is a full mixing of the lake waters, preparing the way for winter. Weather is a major factor in water quality. Lack of rain is good for a lake since runoff is needed to carry the loose soil particles with their attached phosphorus to the lake. The size, duration and spacing of rains and the type of snow cover and snow melt also greatly influence the phosphorus deliveries. It's difficult to compute these variables, but we do our best to factor them in. Although many of our lakes show signs of sensitivity like oxygen depletion, moderate chlorophyll concentrations and reduced clarity, the overall situation is good as compared to southern New England lakes. The challenge is to maintain our water quality. Every summer is unique in its conditions but the same enemy threatens every lake. The more we all know, the better equipped we are to protect our lakes.